Tatranská Javorina is a small village situated in a forested area of the northern end of Rogová below the Belianske Tatras. The village arose form a seasonal houses of sc. Lendava lordship. After building a smeltery for iron ore in 1759, the area was suitable to inhabit permanently. The lack of iron ore caused that the smeltery had to be rebuilt into a paperboard-producing factory (closed in 1935). Kristián Kraft Hohenlohe, a Prussian prince, bought the local estates in 1879. He transformed the village into a forestry settlement and a seat of his lordship. 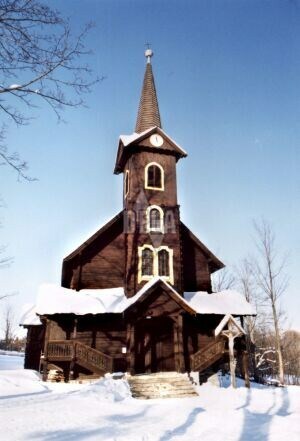 He decided to build a wooden gamekeeper manor-house and a wooden church having folk architecture design. In the forests surrounding the village he founded a kind of today's ZOO, but wild animals from all over the world (such as Capricorn, buffalo, Caucasus deer) were not able to get used to the local climate. Tatranská Javorina estates became property of state in1936. Today, majority of local people work in tourist services and in the High Tatras National Park (TANAP). NOTE: Settlements Lysá Poľana and Podspády are also a part of the Tatranská Javorina village.